What is ‘adequate and appropriate’ will depend on the circumstances in the workplace. This includes whether trained first-aider’s are needed, what should be included in a first-aid box and if a first-aid room is required. Employers should carry out an assessment of first-aid needs to determine what to provide. Below is a list of basic questions and answers about first-aid provision at work. A suitably stocked first-aid box (see Q4). An appointed person to take charge of first-aid arrangements (see Q5). A leaflet giving general guidance on first aid (e.g. HSE’s leaflet: Basic advice on first aid at work ). A pair of disposable gloves (see HSE’s free leaflet: Latex and you – Q9). This is a suggested contents list only. Even if you decide first-aider’s are unnecessary, there is still the possibility of an accident or illness, so you may wish to consider providing qualified first-aiders. Appointed persons are not necessary where there is an adequate number of first-aiders. To help keep their basic skills up to date, it is strongly recommended that your first aiders undertake annual refresher training. The training organisations referred to above can run these courses. There are no hard and fast rules on exact numbers. It will depend on the circumstances of your workplace. After working through the checklist in Table 1, refer to Table 2 which provides a general guide on how many appointed persons or first-aiders you might need. The numbers given in Table 2 are suggestions only. You should assess your first-aid needs in the light of your particular circumstances. 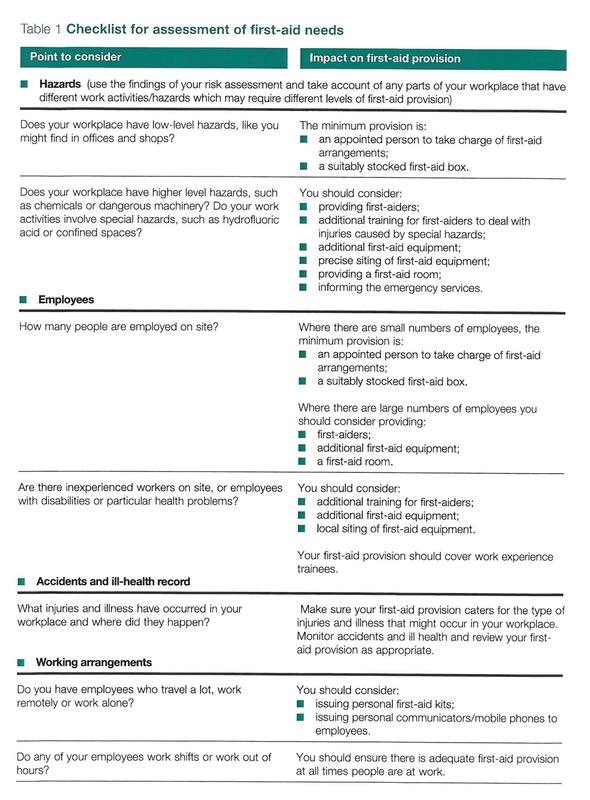 Where there are special circumstances, such as shift work or sites with several buildings, there may need to be more first-aid personnel than set out in Table 2. You will need increased provision to cover for absences.